It is crucial for the food and pharmaceutical industries to ensure timely delivery and correct temperature condition during production, storage, and transport. It is very costly for companies to redeliver if the products are wasted. It is hard to prove who is responsible and liable for mistakes when cargo arrives in poor condition at the final customer. Securing correct delivery quality can be conducted by a cold chain monitoring solution that gives complete control to protect refrigerated and pharmaceutical products to reduce wastage and loss. It enables managers to keep record of the conditions and location during the transportation process and also compliance in the supply chain towards all interest in the delivery process. Today temperature stickers and other solutions are used, but they cannot give a location-based insight on time of incidences, where the temperature has exceeded its thresholds. The new IoT technology drives efficiency throughout the supply chain. IoT sensors and a comprehensive could-based platform are enabling to create visibility, tracking location, performance, and conditions of food, medicine, and other cold chain equipment. An RHT sensor tag measures relative humidity and temperature data. The RHT sensor communicates with an IoT device that is using the GSM network and its internet connection to transmit the data to ensure the users are alerted in real-time. The IoT sensor and device automatically collect and send data to the cloud-based platform that is monitoring the data up against the thresholds defined for the delivery by the user. In case of any of the thresholds exceeds, the system is automatically sending out an alert to the users. The IoT sensors can, for instance, be connected to the food containers that need to be monitored for a longer period. If the temperature in a container falls outside the chosen temperature range, it provides an alert. This enables the manager to react immediately and fix the problem and possibly minimize the risk of losing the products. For example, if a trailer is disconnected, it enables the manager to contact the driver immediately, so he rapidly can stop and check the temperature of the container. Trusted tracking management solution helps business to streamline processes in the supply chain and enhance decision making. Achieve a temperature-controlled supply chain that gains operational efficiency and improves quality control. 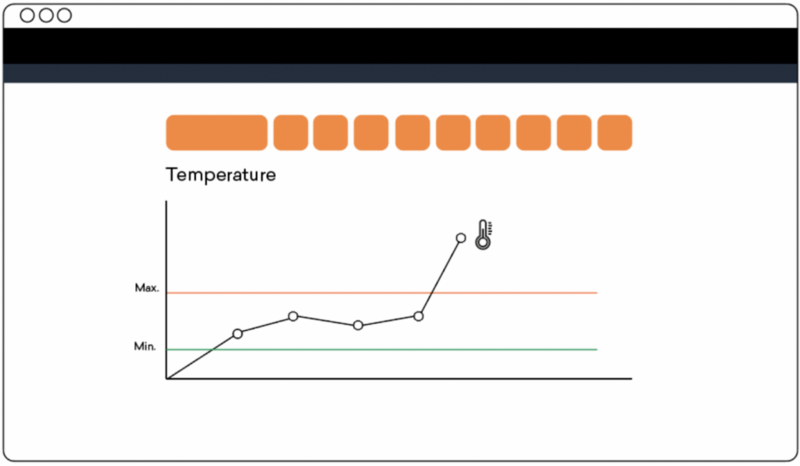 The system can generate a proof temperature report for documentation use. Documentation and quick notification to customers about delays and damage to cargo can lead to increased customer satisfaction. Learn more about Trusted IoT sensors and software, or please do not hesitate to contact us for further information.